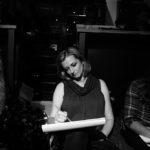 Off-Beat Figure Drawing Sessions are monthly gatherings of first-time to professional artists coming together to create in community. Each gathering welcomes a guest musician to co-create with us, as well as a guest photographer to capture the sweet slow moments of the evening. We often times bring in installation artists, poets or writers to share their art throughout the night. This is a very inclusive non-judgmental community of likeminded open hearted people. You are welcome here. I invite you to come alone, as a couple, or a small tribe of like-hearted to deepen your connection with self and source by means of an intuitive art making experience. The healing process of pouring into process without attachment to outcome is a beautiful way to deepen a dialogue within… to clear away blockages… and to commemorate a milestone in your own or shared journey, leaving you with a tangible visual mantra art piece to serve as a reminder of your reason for wandering. I started painting the interpretation of the occasional readings that I would have done with psychics and mediums as a way to journal my experiences and messages from beyond and keep them close to me as visual reminders of the energies and messages that surround and guide me. 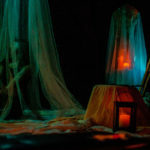 Brush with Light was born as a collaboration offering between myself and curated light workers to bring an unparalleled experience to those wishing to connect deeply with energies beyond and have that connection forever woven into an original work of art.